STL Partners’ New Digital Economics Executive Brainstorm EMEA, took place from 8-10 November in London, and brought together 5 events in 1 venue, co-locating the Telco 2.0, M-Commerce, 2.0 Cloud 2.0, M2M 2.0 and Digital Entertainment 2.0 brainstorms, using a unique and widely acclaimed interactive format called ‘Mindshare’ to help clarify the important ‘next steps’ for both individual companies and industries. Building on output from previous brainstorms and new market research and analysis from STL Partners, it focuses on new growth opportunities at the intersection of Telecoms, Media and Technology. The keynote Strategy Report Dealing with the ‘Disruptors’: Google, Apple, Facebook, Microsoft/Skype and Amazon was launched at the brainstorm, and a similar agenda will be discussed at the New Digital Economics – APAC Brainstorm, Accelerating New Growth Opportunities in Telecoms, Media and Tech, 30 November – 1 December, Capella Resort, Singapore. This note provides an extract of key take-outs and votes on the ‘Voice and Messaging 2.0’ sessions from the EMEA brainstorm for Telco 2.0 readers and subscribers. Brainstorm participants will also receive detailed write-ups and analysis from the event sessions they registered for, and we will be using the input from all the sessions of the EMEA, Americas and APAC brainstorms as input to new analysis across all of the topics covered in the coming months. 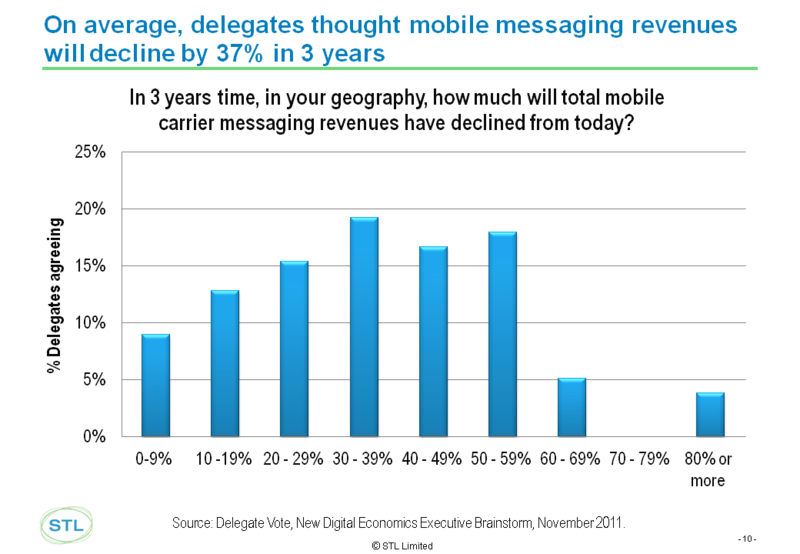 Telco SMS revenue will decline on average by around 40% across the Europe and Middle East region by 2015 according to the senior execs at this month’s Telco 2.0 brainstorm in London. The main cause is competitive pressure from so-called ‘Over-The-Top’ (OTT) alternatives (Facebook, Skype, Google, BBM, etc). The cause of this predicted decline was unambiguous – the impact of so-called Over The Top (OTT) players’ messaging services like iMessage, BlackBerry Messenger, Whatsapp, Skype and Facebook. This is similar to the impact of the new services that we saw predicted in the survey conducted across 300 senior execs in the research for our latest report Dealing with the ‘Disruptors’: Google, Apple, Facebook, Microsoft/Skype and Amazon. Indeed, KPN and some Middle-Eastern operators have reported even higher percentage declines among users of certain devices and applications. 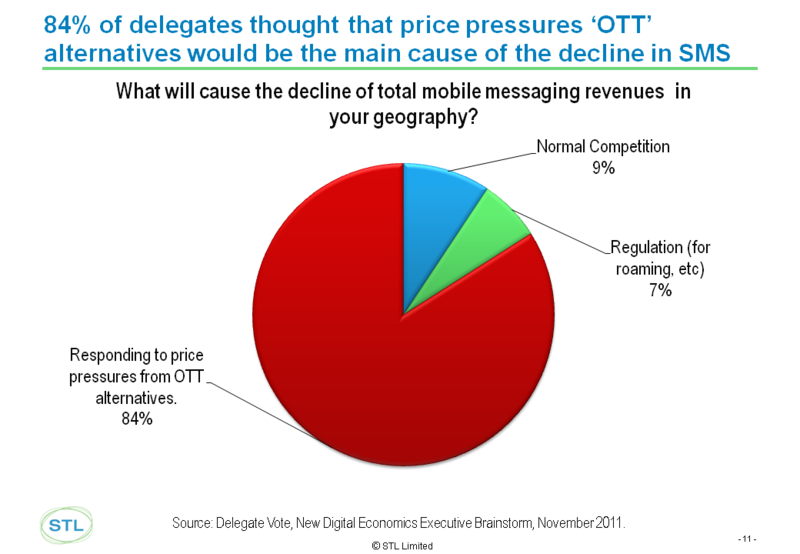 While not as pressing as the impact on Messaging revenues, delegates had a pessimistic view of the prospects for voice revenues. The causes behind the voice declines were seen as somewhat broader, with competition and regulation taking up 56% compared to 16% for Messaging, although ‘Responding to price pressures from OTT alternatives’ was still the main choice with 44% of the vote. All in all, it looks as if the pressures on voice and messaging revenues are beginning to bite as we originally predicted in our 2008 strategy report Lessons from Internet Communications Services – Skype, Facebook, and others: how Telcos can adapt and compete – although the options for adaptation and competition have narrowed somewhat due to the success of the so-called OTT players and the relative lack of action by telcos. Who should telcos fear most? Delegates did not have an entirely consistent view of the threats and opportunities presented by the OTT players as shown below. Figure 5 – Who should telcos support / fear most in voice and messaging? This is not entirely surprising given the relative attractions and perils presented in different scenarios as we describe in Dealing with the ‘Disruptors’: Google, Apple, Facebook, Microsoft/Skype and Amazon. Apple and Google are the established players with the most current power, and hence threat. At the November 2011 EMEA Brainstorm, Cenk Serdar, Director, Data & Communications Service, Vodafone, and Rainer Deutschmann, SVP Core Telco Products, DTAG, carried out a live demonstration of RCS-e, the GSMA-backed future voice & messaging solution using IMS. Morten Sorby, EVP of Strategy & Regulatory Affairs, Telenor, and Andreas Bernstrom, CEO, Rebtel, joined the vibrant subsequent debate with the audience and Simon Torrance, CEO STL Partners. The following is an anonymised top-level summary of the resulting discussions and the votes. Instant messaging, video, and file-sharing are the key features in RCS-e, and are being introduced as a refined set compared to the original specifications in order to bring applications to market as quickly as possible. This refinement was lead by the E5 Group of top European operators. The most important item on the future roadmap is service discovery. Beyond that, contacts transfer, location sharing, and multi-device operation are on the to-do list. Interestingly, it seems that some of the RCS-e use cases focus on supporting enterprise applications such as trying to provide a platform for better CRM and person-to-organisation applications (for example, an enhanced helpdesk for a furniture company). This has consequences for the design of APIs and business relationships facing upstream towards enterprises and developers. While Apple’s iMessenger and RIM’s BlackBerry Messenger are impressive products, they aren’t ubiquitious or necessarily deeply integrated with other applications in the way that SMS, MMS, and telephony could be. RCS-e doesn’t require the user to download any new apps – the vast majority of users aren’t already using sophisticated communications tools like smartphones. RCS-e ‘is a service for mass-market users’ rather than just smartphones. Seven of the major device makers are committed, and the RCS-e standard is an open standard, so nothing prevents Apple iOS or RIM BBX developers implementing it independently. RCS-e is building its global footprint. 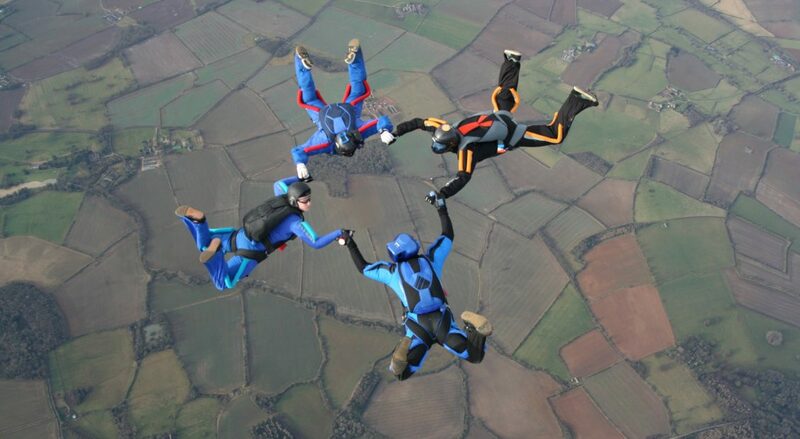 Spain, France, and Germany will launch sequentially between now and the first half of 2012. South Korea is committed to deploying RCS-e, and discussions were going on with other Asian countries. Smartphones will change customer behaviour and catalyse change as more people get them. Horace Dediu, Associate Analyst at STL Partners, predicts that Western Europe and North America will go 100% smartphone within 18 months – so control will be further ceded to the Smartphone OS owners. Cost is the main reason users move to Skype and similar services, and RCS-e doesn’t reduce costs. The feature set just isn’t that convincing compared to what else can be done using VOIP services and other smartphone apps. Delegates were split in their views on the likely efficacy of RCS. Figure 6 – Will RCS-e offer an attractive alternative to OTT services? The value of RCS-e is a subject that stirs strong opinions from across the industry, and it was intriguing to see the extreme polarity of delegate views at the Brainstorm. Figure 7 – Is RCS-e ‘too little too late’? Telco 2.0 will be conducting an in-depth analysis of Messaging and Voice 2.0 strategies, including RCS-e and its prospects in coming months. Our questions on RCS-e at this point are as follows. How many Christmas 2012 handsets will have RCS-e? An critical factor is whether the wave of cheap smartphones will support RCS-e and if so, whether they support it well or only half-heartedly. The great bulk of them will be Android devices, and therefore the key vendors will be HTC and Samsung. HTC are signed up, but their device line-up is concentrated on the high end, and they are very much second to Samsung in terms of volume. Samsung is shipping more Androids than any other vendor, and indeed more smartphones than any other vendor, and they have a portfolio of products from the Ace to the Galaxy S II rather than a single top-end hero product. A key question is to what extent across their handset range they will sign up to RCS-e.
Are the features really convincing? It is notoriously difficult to accurately predict the appeal of features in advance of consumer trials. However, a challenge for operators will be that, unlike Apple, they will have limited control of the design and implementation of the end-to-end customer experience. How quickly can RCS-e evolve? An important issue regarding services “embedded” in the core network or the device operating system is that they are unlikely to get upgrades anywhere near as quickly as either standalone applications or Web services. Operators tend to be slow to push out OTA upgrades to device OS, even after the manufacturers release them, and software iterations in the core network are taken slowly for very good reasons. App developers and Web 2.0 players tend to have much faster development cycles, so in terms of both user experience design control and release iteration operators are at a disadvantage. What is RCS-e realistically intended to achieve now? 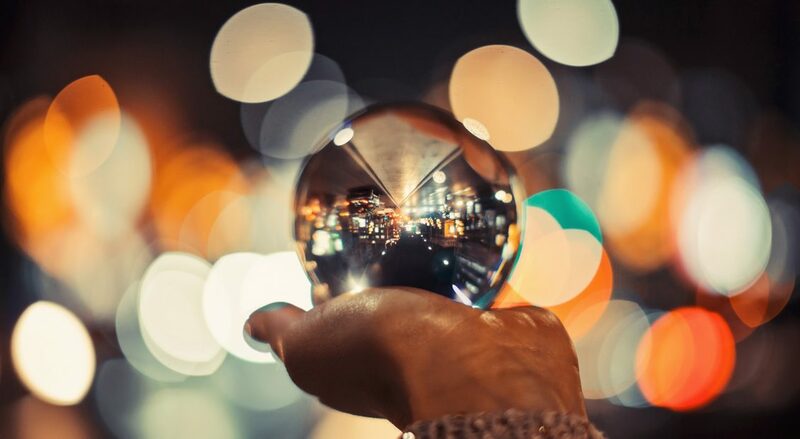 Opinions vary on what RCS-e is meant to achieve for operators, though few people we’ve spoken to in private recently believe that RCS-e is a ‘silver-bullet’ to combat so-called ‘OTT’ revenue erosion. Indeed, there appears to be a growing minority who appear to have ‘given up’ on voice and messaging revenues. A more tenable position perhaps is that RCS-e may help a little, and that extending the life of the Messaging and Voice revenue streams by only a few months would justify the business case. One argument we’ve heard is that RCS-e is about enhancing and protecting the telco services bundle of minutes, texts, and data. In a wider sense, it is a move by operators to provide something new to consumers, and it may at least be a small step to revitalise their relevance to consumers. In our view, it is far from the only strategy that operators should explore.